A reception was held on Saturday 17th november to mark the opening of the first phase of Les Beaucamps High School in Guernsey. The new Les Beaucamps High School provides new teaching facilities for 660 students, replacing the existing building on the same site. A separate sports building to include a swimming pool, sports hall and gymnasium will be completed next year. In 2003 following an expression of interest and presentation of concept designs, Design Engine Architects were invited by the States Education Department to prepare proposals for the replacement of Les Beaucamps High School, Guernsey. Design Engine began to look at site location options and planning issues but significant detailed work on the Les Beaucamps project was not resumed until 2008. The new Les Beaucamps High School was to provide new teaching facilities for 660 students, replacing the existing building on the same site. In addition to the school building located on the sloping site overlooking Cobo bay to the West, a separate sports building to the East was to include a swimming pool, sports hall and gymnasium. The two buildings were to sit either side of the sports pitches on the flat part of the site. The project was to be split into two construction phases, the School Building (Building A) and the Sports Building (Building B). The new Schools location was to allow the existing school to remain in operation during the works. The practice has benefited from an extensive dialogue with the commissioning and end-user client. This input from experienced educationalists has allowed Design Engine to develop a collegiate plan model for the school arranged around a central cloistered courtyard. This location has spectacular views out to the surrounding rural location and sea. The practice has been able to challenge many of the current trends and conventions in school design, providing teaching spaces of an appropriate size and layout for modern learning. These spaces are arranged around naturally lit circulation routes within a safe and secure leaning environment. The courtyard arrangement is split across a stepped section creating various terraced external areas and degrees of enclosure to the internal cloister. The larger double height spaces of the hall and library are sunk into the slope at the top of the site to reduce their visual impact. The Craft, Design, Technology workshops and Food Technology spaces are located at the bottom of the slope where they can be serviced easily and make use of the flat external areas. The North and South wings of the building accommodate general teaching spaces over two levels with the upper floor benefitting from the vaulted roof spaces. The art rooms in the South wing have North-facing dormer windows providing excellent natural light. All teaching spaces are naturally ventilated with a combination of external window vents and internal ventilation chimneys that break the ridge line. Each classroom has clerestory windows that also borrow natural light from the corridor and courtyard. 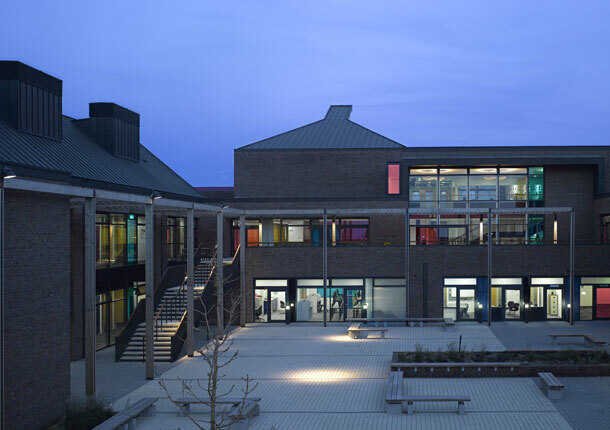 The courtyard can be accessed at various levels and is intended to be used throughout the school year providing external break out, communal and teaching space. It provides protection from sea winds in the winter months and shaded space in the summer. A central terrace with sea views extends from the hall and dining spaces. The sensitive rural location for the school and the challenging planning requirements demanded an approach that had parity with adjacent traditional buildings and worked with the terraced topography of the site. The massing of the building steps up the slope enclosed by existing Guernsey banks marking the original field boundary. Dark grey zinc has been used for the roofs to have tonal parity with the traditional Guernsey slate roofs. The hedgerows and Guernsey banks forming the field boundaries across the island and our site are made distinctive by the wild flowers within them. The magenta coloured glass within the building takes its cue from the Campion flowers that dominate the hedgerows throughout the spring and early summer. The cyan coloured glass has synergy with the spectacular seascape and sky. For this project a specific brick blend and mortar colour has been developed, “Beaucamps Blend” that incorporates within it the hues of the local granites.